What is the easiest way people have found to get tie rod ends out? Is there any special thing I need to know when I put new ones in? 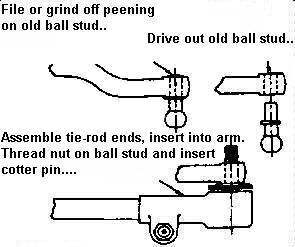 The tie rods on the stock front end components are the ball stud type connections – if you’re going to replace with traditional type tie rod ends, you’ll have to grind off the peening of the old ball stud and drive it out with a hammer or a press. It is easier to remove the steering arm from the front hubs and do this off the truck. A diagram of this is shown at right. The driving out of the old pin is far harder than it appears. I carried mine to our machine shop at work and asked the head machinist. After grinding off the peening, we drilled a small hole working progressively bigger, Not to big to drill into the steering arm. He then placed the ball in a large vice, clamped down on it. He then delivered a couple of sharp blows to the opposite end of the arm in attempts to twist the arm on the stud to break the seal. A couple of whacks and it moved, we then drove them out with a punch. We did both in about 20 minutes.. Here is an update to the subject of replacing original tie rod ends with the newer style. The directions I’ve seen all tell you to grind off the peened end and drive the old pivot ball out. Mine were not quite that easy. After a shot with the die grinder we spent a few minutes in the shop press at 30 tons with moving a .001 of an inch. From there we chucked them up in the mill and took a few cuts on that surface to clean things off. Back in the press for another non-eventful 30ton session! OK time to get nasty. We drill the center out to 3/8″ and get the torch out. At about 25 tons the first on gave way and pressed out. Much to my amazement the hole in the steering arm had been countersunk before the ball was installed. This left about .015″ X .015″ of chamfer material. The milling left a nice circular image of the pin but who knew it was .030″ in diameter larger than the actual hole in the arm.